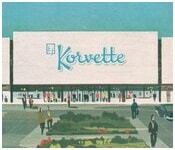 E. J. Korvette was an American chain of discount department stores, founded in 1948 in New York City. It is notable as one of the first department stores to challenge the suggested retail price provisions of anti-discounting statutes. It is also notable for its failure to manage its business success which led to decline and its 1980 bankruptcy and closure.